To further accentuate their cake-like appearance and consistency, I used a two-ounce scoop to portion the dough, resulting in bigger than usual cookies. They have a moist crumb and they’re packed with the rich, warm flavors of the orange zest and pumpkin spices. The brown sugar-orange glaze blankets them with a sweet finish. I had originally intended to add some mini chocolate chips to these cookies, but, surprisingly, I didn’t have any in the cupboard, so I substituted some chopped pecans instead. You may also add raisins or cinnamon chips as well. Heat oven to 350 degrees F. Line baking sheet with a silicone mat or parchment paper. In the bowl of a stand mixer fitted with the paddle attachment, beat 1 cup butter on high speed for 30 seconds. Add granulated sugar, baking powder, baking soda, salt, cinnamon, nutmeg, ginger, and orange zest. Mix until combined, scraping bowl occasionally. Add egg, 1 teaspoon of vanilla extract and 1/2 teaspoon of orange extract. Add pumpkin purée and pecans and mix well. Add flour and mix until just combined. Using a 2-ounce scoop, place dough on baking sheet 2 inches apart. (For smaller cookies, drop a heaping tablespoon of dough and bake for about 10 minutes.) Bake for 15 to 17 minutes or until edges are golden brown and cake tester inserted in the center comes out clean. Transfer cookies to a wire rack to cool. To make the glaze, heat 1/2 cup butter and brown sugar in a small saucepan until melted and smooth. Transfer to a medium bowl. Stir in milk, orange liqueur (if using), vanilla, and orange extracts. Beat in powdered sugar, a cup at a time, until smooth. Adjust consistency of the glaze by adding more powdered sugar, if needed. The glaze works best if it’s a little runny, so it spreads easier. The glaze with harden in an hour or two. Spread warm frosting immediately on cookies. Adapted from Better Homes and Garden. Hmmm, maybe an autumn roundup is a pretty fabu idea. Look at you go! Yes, of of course , especially since you’ve let me know in advance. Thanks for asking and for being included. So fun and they look so pretty!!!! Thanks for sharing. Must try. Thanks for this stylish, well written and photographed blog. These are delicious! I made them for my boyfriend yesterday! Thanks for visiting and letting me know. I hope your bf liked them! The post is up Daisy, thanks for the great cookies!! Thanks for featuring my pumpkin cookies! I saw it! I’ll have to look around your blog some more when iget home from work! I am going to poke around some more here too! Thank you. How charming of you to say! Yum! I like cake-y cookies – these look amazing. I prefer cakey cookies. I’m not a fan of crisp ones. Thanks for visiting, Heidi! Look amazing, and have forwarded to hubby to make 🙂 Beautiful photo! How scrumptious! 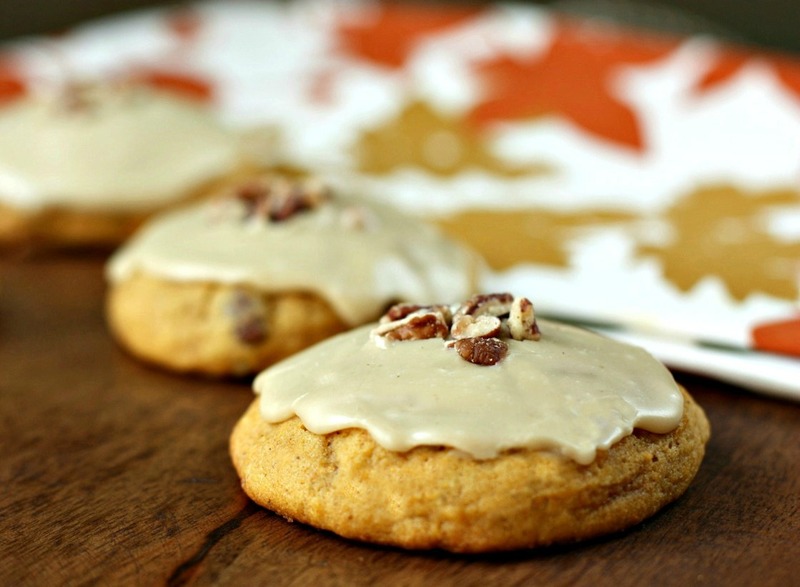 Having tons of pumpkin puree in my fridge, I’m adding these to my to-bake list. They will make for fabulous holiday gifts for neighbors! Thank you for sharing, Daisy! PS: Oh, the glaze!! Yum! The glaze was what really peaked my interest. I’ve never made one with brown sugar before and I loved it. I had leftover pumpkin puree too; hence the cookies! I adore pumpkin cookies and love your version, Daisy! Such pretty photos as well.. a taste of Autumn here!! Thanks, ‘smidge! They went fast! Yum!! I am going to make these really soon! I will if I get a chance to have one! I have to fight the family for one! Yes, and just like that it’s hot again down in LA! I’m just going to pretend it’s fall and start making soups, and other comfort foods. I might as well give away my sweaters and coats!